Moreso than any seat I think I've ever seen, the Karuselli Chair looks like something that should be stationed front and center on the bridge of the starship Enterprise. Can't you just see Kirk in there, doing a power swivel to talk biz with Spock or Scotty? In reality, the fiberglass classic was not conceived in space; it debuted fifty years ago here on Earth, and this short vid gives a fascinating glimpse behind the scenes of how it's made. Finnish designer Yrjö Kukkapuro started developing Karuselli—aka "carousel"— in the 1950s, but it wasn't until 1964 that he committed to the now-iconic swooping bucket shape; it took him that long to perfect the form, using his own body as ergonomic muse and test model. Now, in honor of its semi-centennial, Finnish furniture manufacturer Artek has announced it will be producing Kukkapuro's icon—made in Finland, natch. Check out how it's manufactured; the process features a genuinely surprising amount of hands-on TLC for something with such a sleek silhouette. Every step has a human touch, and there's something kind of wonderful about seeing the premium leather cushion being attached to this polished, impossibly smooth shape with regular old clothespins. For decades after its mid-century hey-day, fiberglass was a tough sell in the industry. 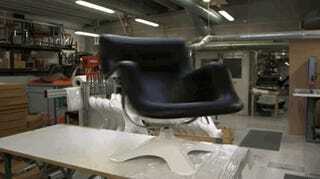 Herman Miller quit using it on the Eames Shell in 1989 because its make-up wasn't environmentally friendly or recyclable, but just last year introduced a new, safer, monomer-free resin and emission-free technique (which also happens to be mesmerizing to watch).